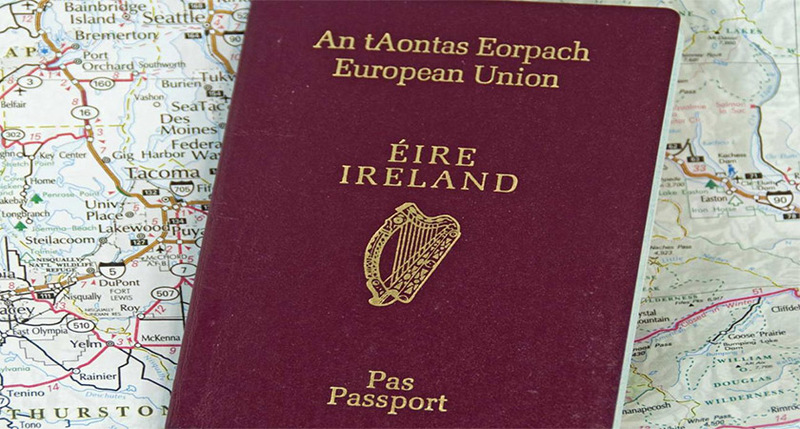 The volume of European Union burgundy-colored passports issued by the Republic of Ireland reached record proportions in 2017. The Department of Foreign Affairs in Dublin indicated that it received some 785,026 passport applications in 2017 and duly processed the majority of applications by issuing 779,184. The rationale for this upsurge is believed to be some kind of Post-Brexit interest for Irish passports, as 1 person in 5 of the notable 779,000 Irish passports issued this year by the Republic will end up in the hands of people living in Britain. It would therefore be fair to assume that many of these British applications desire the right to maintain EU status, and as such, live in one of the remaining 27 EU member countries. In some cases there may be a wish to have one foot in each side of Euro-zone to see how things pan out. The Republic of Ireland issued 779,000 passports in 2017. 81,752 passports were issued to people from Northern Ireland in 2017, up 20% year on year. 81,287 passports were issued to people from Britain issued in 2017, up 28% year on year. Prior to Brexit, the Republic of Ireland issued on average 50,000 Irish passports to British subjects each year. People born in Northern Ireland have an automatic right to Irish citizenship, while British people with an Irish parent, or in certain circumstances an Irish grandparent, also have an automatic right to become Irish citizens.